Members of the public asked the city to enforce who can breed puppies and how frequently. 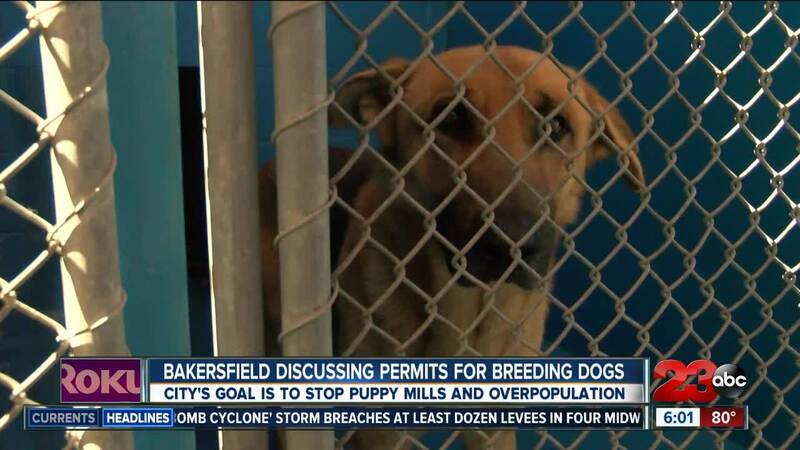 BAKERSFIELD, Calif. — City of Bakersfield officials discussed creating required permits for city residents in order to breed puppies at a special meeting Monday, March 18. Members of the public voiced their concern about excessive dog breeding at the Bakersfield City Council meeting in January and suggested creating a licensing system to regulate who can breed dogs and how frequently. Steven Teglia, Assistant City Manager, made a presentation with examples of how other California cities regulate this issue. Some questions raised revolved around if families who have litters once a year would need permits, how much the permits would cost and how they would be both regulated and enforced. A majority of city leaders agreed that the main concern is not families at home who have litters occasionally, but rather the people who run puppy mills. No decisions were made at the meeting but officials agreed to move forward with continuing to brainstorm how best to implement breeding permits.